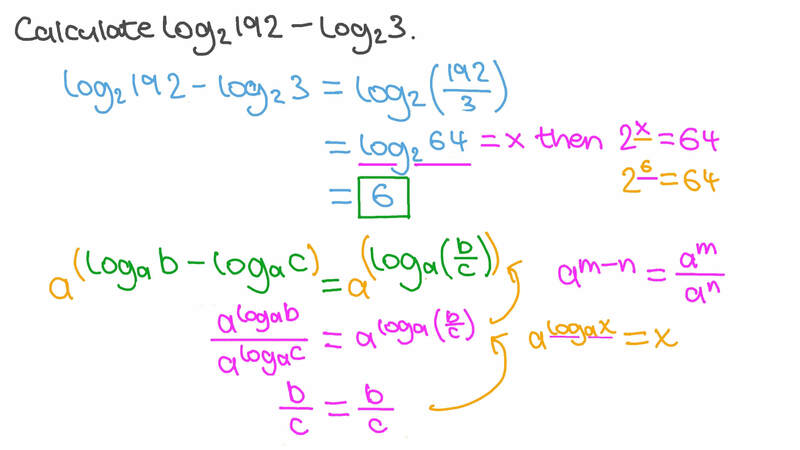 In this lesson, we will learn how to use the laws of logarithms to simplify logarithmic expressions. Calculate l o g l o g 2 2 1 9 2 − 3 . Find the value of l o g l o g l o g 4 4 4 1 2 8 0 − 2 2 − 5 without using a calculator. Simplify l o g l o g 3 2 1 6 × 2 4 3 . Determine the value of ( 3 ) − 9 3 − 1 0 0 l o g l o g l o g l o g 2 without using a calculator. What is the value of l o g 0 . 0 4 − 3 ( 0 . 2 ) ? Without using a calculator, find the approximate value of l o g 3 5 2 4 3 given that l o g 3 5 ≈ 1 . 4 6 5 . Find the approximate value of l o g 4 2 0 , given that l o g 4 5 ≈ 1 . 1 6 1 . Given that l o g 7 3 ≈ 0 . 5 6 4 6 , find, without using a calculator, the value of l o g 7 1 4 7 correct to four decimal places. Determine the value of l o g l o g l o g 2 2 2 7 1 0 0 − 5 6 2 3 + 2 5 2 3 without using a calculator. Given that 𝑥 = 5 + 2 √ 6 , find the value of l o g  1 𝑥 + 𝑥  . Find l o g 3 √ 3 2 7 . Find the value of l o g l o g l o g l o g l o g 4 4 4 4 4 1 3 2 + 1 4 2 + 1 6 − 1 2 − 6 4 without using a calculator. If 𝑎 ∈ ] 1 , 1 0 0 0 [ , what interval contains l o g 𝑎 ? Given that l o g 7 ≈ 0 . 8 4 5 1 and l o g 2 ≈ 0 . 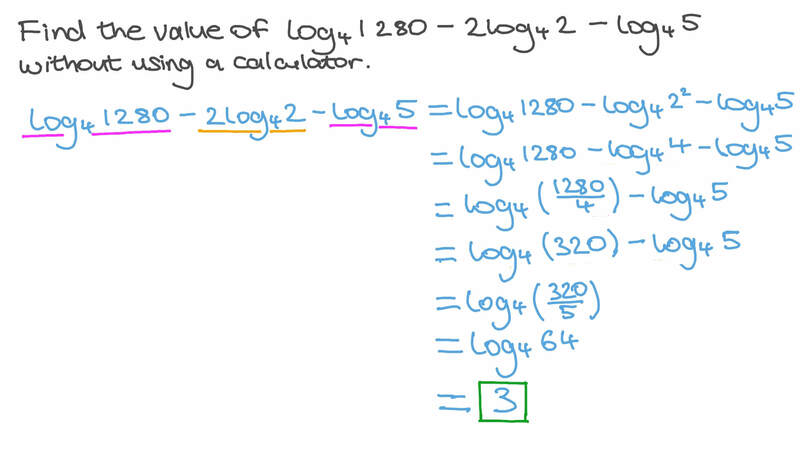 3 0 1 , round the value of l o g 2 2 4 without using a calculator. Find the value of 5 × 8 9 1 5 0 2 0 0 3 0 0 correct to four decimal places. Find the value of l o g l o g l o g l o g l o g 2 2 2 2 2 4 2 + 4 7 + 6 √ 6 2 9 4 − 7 √ 6 without using a calculator. Find the value of l o g l o g l o g l o g 4 2 3 9 5 1 2 × 7 2 9 × 2 5 6 × 2 7 , giving your answer in its simplest form. Given that l o g 2 = 𝑥 and l o g 9 = 𝑦 , find l o g 7 2 in terms of 𝑥 and 𝑦 . Calculate l o g l o g l o g l o g 2 2 2 2 0 . 0 8 1 − 2 4 3 1 6 + 1 5 5 8 − 1 1 2 . Given that 𝜃 ∈  0 , 𝜋 2  , evaluate l o g c o s l o g s e c ( 𝜃 ) + ( 𝜃 ) . Find the value of 2 2 5 +  1 2 + 1 8  + 7 2 − 8 0 l o g l o g l o g l o g 2 5 2 5 2 5 2 5 in its simplest form. Simplify 𝑒 l n ( ) 1 2 completely. Evaluate l o g l o g l o g 𝑎 𝑏 𝑐 𝑎 𝑏 𝑐 𝑎 𝑏 𝑐 𝑎 + 𝑏 + 𝑐 . If 𝑥 is any real, positive number except 1, which of the following is equal to l o g 𝑥 𝑥 𝑥 ? Is it true that l o g l o g l o g 𝑎 𝑎 𝑎 ( 𝑥 + 𝑦 ) = 𝑥 + 𝑦 ?